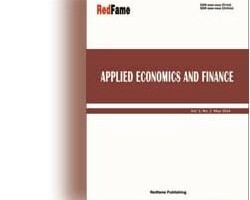 Applied Economics and Finance (ISSN 2332-7294; E-ISSN 2332-7308) is an international, peer-reviewed, open-access journal, published by the Redfame Publishing. The journal is published bimonthly (January, March, May, July, September, November) in both print and online versions. The journal accepts article submissions online or by e-mail. Authors are encouraged to submit complete unpublished and original works, which are not under review in any other journals. AEF is dedicated to promoting scholarly exchange among teachers and researchers worldwide in the field of economics, financial economics and finance.